Facebook is one of the most popular social networking website that allows users to upload and store unlimited number of image files plus video sharing. Thus, lingering around and browsing Facebook has been great pass time for many, but viewing friends profile and pictures may be a repugnant task when Internet connections slow, unless with the help of Facebook Photo Zoom. Facebook Photo Zoom is a free photo viewer application and extension for the Google Chrome and Mozilla Firefox web browser. This application is user-friendly with a simple interface. With this application, users just need to hover over image to zoom-able the image for zoom in and zoom out that they want to view. This application comes with better zoom fitting especially when image is taller than the window, minor styling, and captions for images with titles without disturb or delete the original photos. 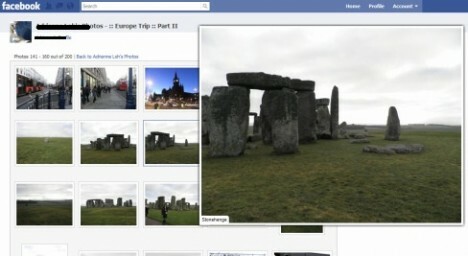 Facebook Photo Zoom can be downloaded by using the link below and is now been updated to version 1.1005.25.1. Note: Users can turn off and on Facebook Photo Zoom easily just by clicking the icon next to the chart bar in the bottom right or simple pressing Ctrl + Shift + Z keys will also toggle its functionality.